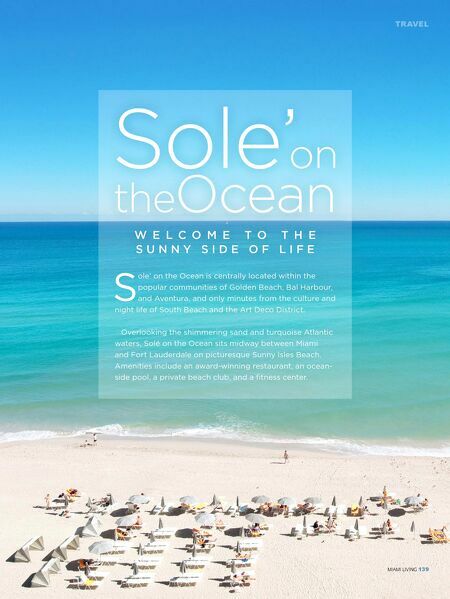 Sole' on theOcean Welcome to the sunny side of lif Sole' on the Ocean is centrally located within the popular communities of Golden Beach, Bal Harbour, and Aventura, and only minutes from the culture and night life of South Beach and the Art Deco District. Overlooking the shimmering sand and turquoise Atlantic waters, Solé on the Ocean sits midway between Miami and Fort Lauderdale on picturesque Sunny Isles Beach. Amenities include an award-winning restaurant, an ocean- side pool, a private beach club, and a fitness center.